Exercise and healthy eating habits…. it’s the elephant in the room at your corporate event. Conferences carry a bad reputation of allowing attendees to travel further down the path to a sedentary lifestyle. Session after session planted in a seat with the ever-present snack stations at every turn aren’t good for anyone’s health. “Company updates and networking are all important functions of meetings, but so is demonstrating meaningful change that can be made in one’s life” – Dr. Oz, Cardiothoracic Surgeon. Sleep is one of the biggest health problems in the U.S. Our busy lives create a growing importance of completing tasks, and sleep often gets put on the back burner. Too often conferences are jam-packed with an absurd amount of obligations for attendees. We expect them to go to a cocktail party until midnight, then be up and excited for the first session at 8AM. That never really works out the way we want it to. Instead we create a conference full of caffeine strung out zombies by the end of the day. 45% of Americans say that poor or insufficient sleep affected their daily activities according to the National Sleep Foundation. Offset this problem and don’t schedule too many things for one day or start the day’s activities a little later in the day. Not only will your stakeholders be more engaged, but they will definitely thank you for not running them so hard and creating an information overload. Odds are most of your attendees have a 9-5 desk job where they spend most of their day chained to a desk. When they get to the conference, the last thing they want to do is spend more days planted in a chair. Plus it’s not the best way to get them to learn. Sitting for long periods of time decreases brain flow, and inhibits our ability to think clearly. Use your breakout sessions to break the participants out of their stationary rut and get people moving. There are so many options to get people active during a presentation. A simple solution would be to let everyone take a quick walk outside halfway through. This time can be utilized to give them points from the session to think on, and to come up with questions. Once they have taken the time to get their brain moving don’t stop there. Ask questions during the presentation and require audience members to stand in order provide input or voice their opinion. If you are working with a more introverted group that might be afraid to speak out, have activities where everyone participates at once. Create stations during an interactive presentation to allow people to move from place to place learning something new at each point. When thinking about the health and wellness problems at conferences, we often place a lot of emphasis on the lack of physical exercise but forget to mention another huge problem. The abundance of food provided in every location can be quite the energy and engagement killer. Not only is food often in high quantity at events, it’s usually very unhealthy spreads provided. This causes attendees to eat more than normal, while also developing a poor diet throughout the weekend. Breakfast may be the most important meal of the day, but according to Forbes, the typical breakfast offering consists of 50% sugar. These higher sugar counts can cause a midday crash and generate sluggish overfed attendees who are just ready for a post-meal nap. Avoid this occurrence and stay away from offering so many high-calorie convenience foods. Think more veggie trays and trail mix and fewer cheese plates and donut trays. Work with on-site vendors to provide healthy snack booths throughout the event location. For example, the Ritz-Carlton in Naples, Florida is providing healthy snacks with their “VegOut” package available for conferences. Once you have them eating healthier at the conference center, help them make better choices when they’re on their own. Utilize your mobile event app to provide healthy off-site dinner, lunch and breakfast locations. Be sure to highlight some of the most popular or best dishes to really make their choices easy. Sometimes it can be hard to get people excited about making healthier choices, but it can be a lot more fun with a group of people. Leverage group workouts/activities as a way to bring your people closer together. When you’re designing a non-traditional event, it doesn’t have to be just 5Ks and yoga classes. For more extroverted participants who love to get involved, try some healthy eating trivia activities. The Biggest Loser Resort created the “Smart Choices Challenge”, a Family Feud-style game with health and exercise based questions. Cater to more introverts with a short golf game where running or walking the course is encouraged instead of driving to each hole. If water is accessible, paddle boarding or kayaking is a fun activity suited for people of all ages and athletic abilities. In order for your attendees to get the most out of your corporate event planning, be sure to know the interests of the group. A carefully designed game plan can help foster more connections, and help everyone have a great time. Hyatt’s Global Summit featured a morning group run on each of the 3 days because they knew most of their attendees were big on running. Follow their example and send out a survey with registration to find out what activities your people like. Location is everything when it comes to thinking about the type of activities that can be implemented during the conference. No one wants to travel to a new place just to see the inside of meeting rooms and conference centers. Keep attendees excited and choose a destination where it will be easy to actively explore the city. Mountain locations allow for more hiking, biking, or possibly horseback riding. City locations are perfect for walking, whether it be from session to session, or from the hotel to a popular dinner spot. To implement this, encourage attendees to walk instead of getting an Uber. At their recent annual event, Target gifted all their attendees with Fitbits at their annual meeting to encourage more walking. Wherever your location, don’t just focus on using the landscape around you, take advantage of local gyms or exercise areas. This can be a great way to showcase something that is unique to the city itself. The attendees get to have fun exercising, while also exploring different parts of the city. It’s also the perfect opportunity to implement offsite ticketed activities to promote a chosen charity. Good news: Wellness at conferences is trending. The Incentive Research Foundation Wellness in Meetings and Incentive Travel Study checked in with planners and hoteliers who report that 64% use a smoke-free property or facility; 38% allow access to a fitness facility; 37% give frequent breaks to encourage moving; 36% call for casual dress to help encourage activity; 21% use venues within walking distance of the hotel. Don’t let your conference be the reason your attendees have to buy new pants when they get back. Lead by example and structure your event around healthy practices that your attendees can utilize in their everyday life. Why stop at just new health and wellness initiatives at your next event? 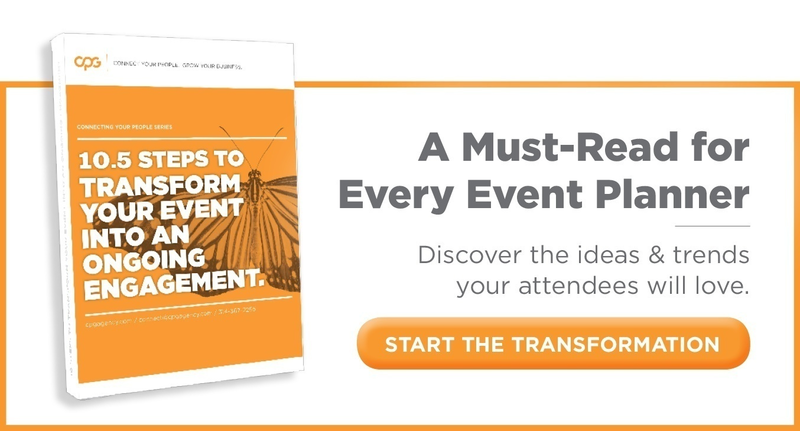 Take your event to new heights and check out our eBook to find some great ways to transform your annual meeting.